Commercial drum crushers will help your company save money by reducing the number of times you need to have your waste drums and metal containers taken away for recycling or disposal. 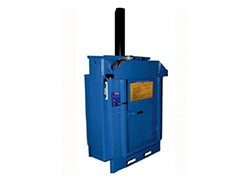 Our hydraulic drum crushers are easy to operate and will crush drums and metal containers safely. More drums can then be stored in the space you have available. Crushing oil drums will also help you retrieve more waste oil – the crushers can hold up to 30 litres. The Phoenix Compactor drum crushers are constructed to meet your waste management requirements and satisfy all CE regulations and safety standards.